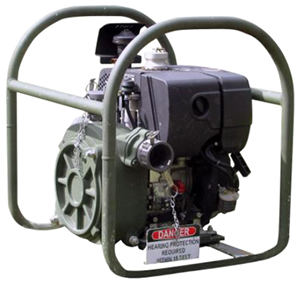 The Expedient Refueling System is an easily transportable and high mobile tactical fuel system designed for refueling ground vehicles in advanced positions and consists of a 150 GPM pump and ancillary components necessary to establish two refueling points. The system is normally used in conjunction with the 500 gallon bladder (B0570) and the 3000 gallon collapsible tank. (B0573), but can be used with various fuel sources. Can be deployed as a complete system or tailored to meet specific mission requirements. Forklift support is required.